The stores have all turned to pastel colors as Easter is quickly approaching. Are your preschoolers getting excited for the upcoming holiday? Mine sure are! 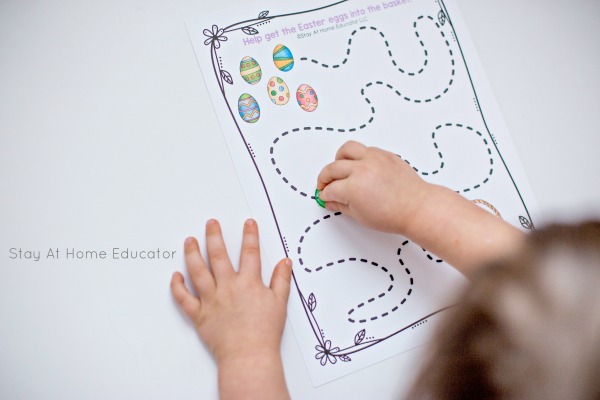 Here are six printable Easter activities for preschoolers. Even if the Easter Bunny isn’t your thing, there are a lot of fun, and even academic, ways to enjoy the Easter season with your preschoolers. These printable Easter activities for preschoolers hit a lot of math skills as well as literacy skills. They are just the right addition to your Easter themed preschool centers, and can even fit into your spring preschool theme, too. You see, there can be a lot of overlap between Easter and spring. 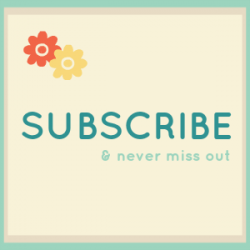 Baby animals, warming weather, flowers, bugs and even all the pastel colors. My little boys have been loving these printable activities. 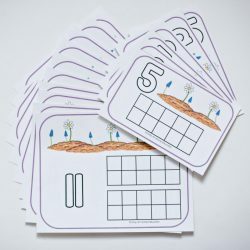 They are easy to prep, like all my printables, and work on both literacy and math skills. From number identification and sequencing to letter matching and sound recognition. My preschoolers have been enjoying these Easter activities in our preschool centers, but I also love them for small group work, too! Check out my new printable Easter activities for preschoolers below! These printables are designed to be laminated and used again and again in your preschool centers and small group activities. 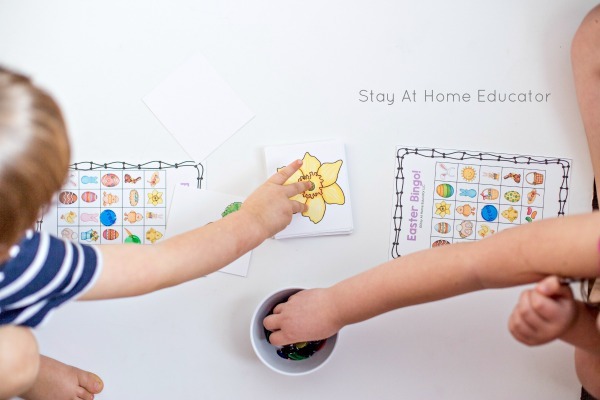 But even if you are just using these Easter printables in your home, your preschooler will love being able to do them over and over again, and she’ll gets lots of practice, too! Ready for the best printable Easter activities for preschoolers? These will complete your Easter themed lesson plans. Preschoolers count the number of items and then use clothespins or paper clips to clip the corresponding numeral. 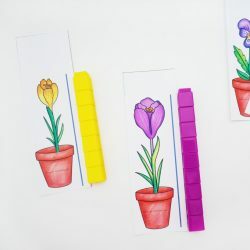 Clip cards are a fun way to reinforce basic concept skills such as counting and letter identification but also they are a fantastic way to encourage fine motor skills! Preschoolers love the challenge of using the clothes pin to place on the card. This helps them work a modified pincer grasp, which is necessary for a mature pencil development. Paper clips are a good alternative, although your preschooler will not get the same pincer grasp movement but rather fine motor coordination. Use the numerals on each puzzle strip to order the pieces and put together the puzzle. 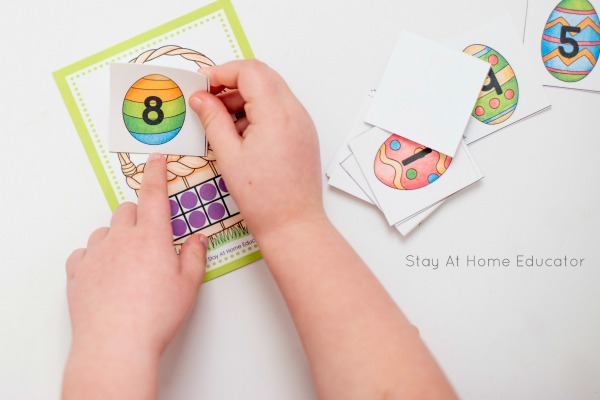 These puzzles help preschoolers with number identification and sequencing. They also expose preschoolers to basic concepts of increasing and decreasing quantities. The pictures are bright and colorful and inviting. They have plenty of imagery to help preschoolers figure out the number order if they have not mastered all number identification. Use a button and push it along the dashed lines to get the Easter eggs to the basket. These pages can also be used as traditional tracing sheets. Push tracing is a good alternative for preschoolers who either don’t have any interested in tracing or for preschoolers who find tracing frustrating because of an immature pencil grasp. In fact, if your preschool has no interest in drawing or coloring it might be because they have an immature pencil grasp, which means they need more fine motor work that mimics the pincer and tripod grasp without it feeling laborious. Push tracing helps solve that problem. We used a transparent math counter here, but you can also use pom poms, floral pebbles, table scatter gems, or buttons. You can even put these sheets in a dry erase pocket and use dry erase markers for traditional tracing. But our favorite thing to do was to ” trace the lines” with thin playdough snakes. Draw a bingo picture card from a bag or pile and place a marker over the corresponding picture on the game piece. The player to get five markers in a row wins that round. Don’t skip “the games” this Easter! 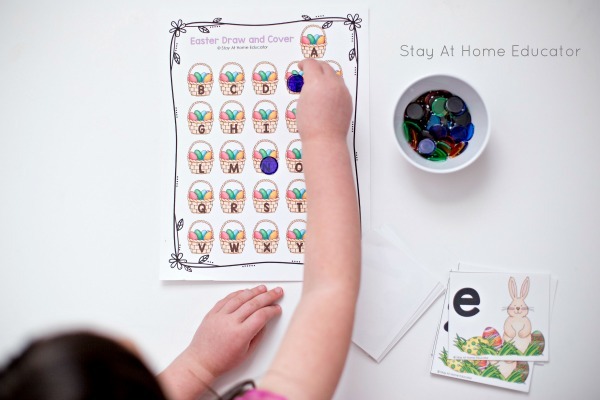 Easter bingo is one of my favorite ways to add literacy work to my preschool Easter centers. That’s right. Literacy. 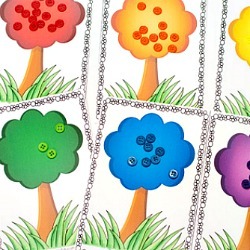 Games like bingo where a preschooler must find and match pictures help develop visual discrimination skills which are required for learning how to read. They are also just good cognitive exercises, too. This pack includes six different game boards and over thirty different colorful Easter images, too! Match the numbered Easter eggs to the corresponding ten frame Easter basket. 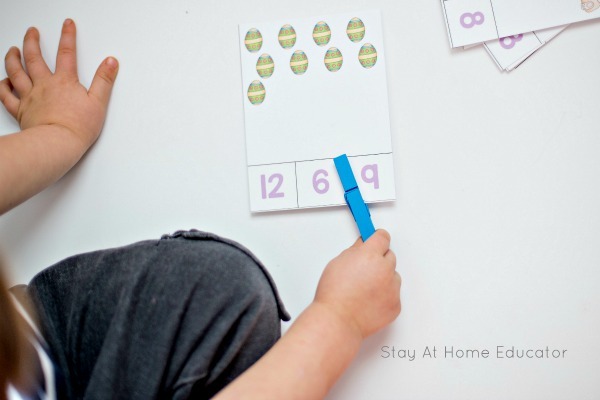 How cute is this Easter ten frame activity! 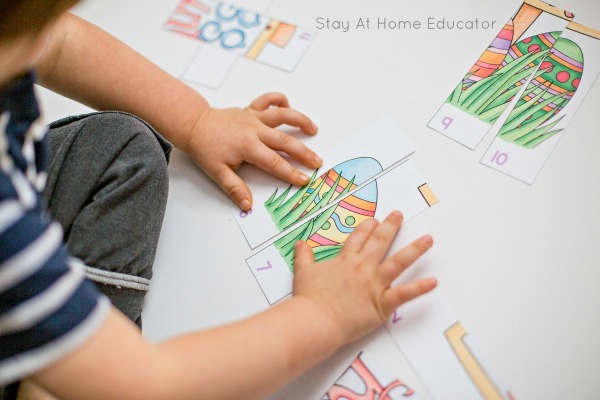 Preschoolers get to practice one to one correspondence skills and number identification by matching the numbered Easter eggs to the corresponding ten frame Easter basket. Numbers range from 1-20 so you can pick and choose the card sets your preschooler needs the most help on. While I didn’t take the time to cut out the Easter eggs to be rounded, they are even cuter and more inviting if you take that extra step! 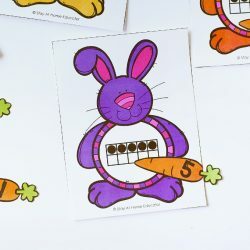 Draw an Easter bunny letter card and use a counter to cover the Easter basket with the corresponding letter on it. The goal here is to go through the entire alphabet and make all the matches. Sometimes it’s fun to organize the cards so that the letters in your preschooler’s name are drawn first. That gets them excited about the activity! 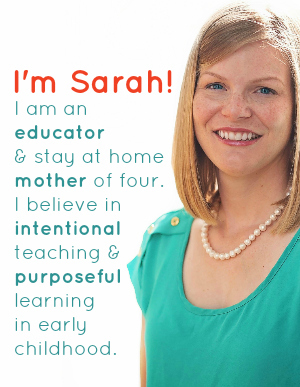 But I always recommend starting with the most familiar letters anyway and it helps keep your preschooler from automatically feeling defeated if they have not completely mastered all their letters. 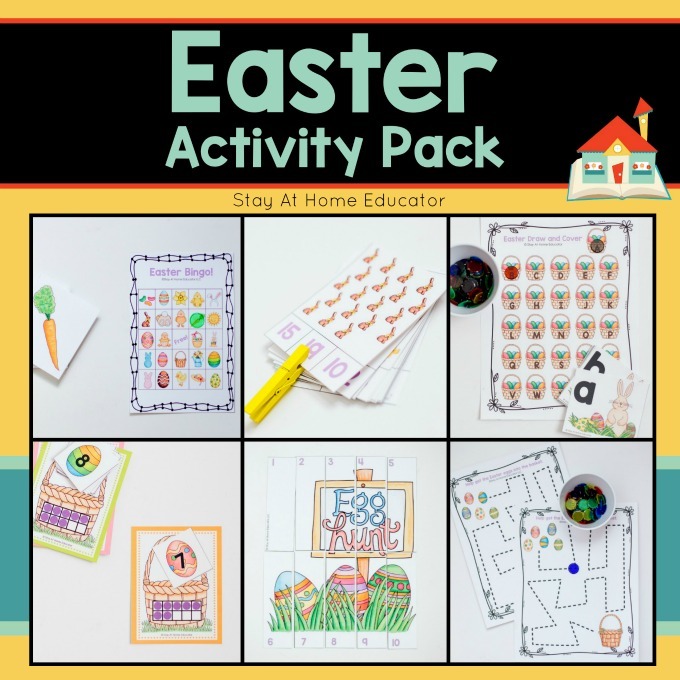 Grab Your Easter Activity Pack Here! 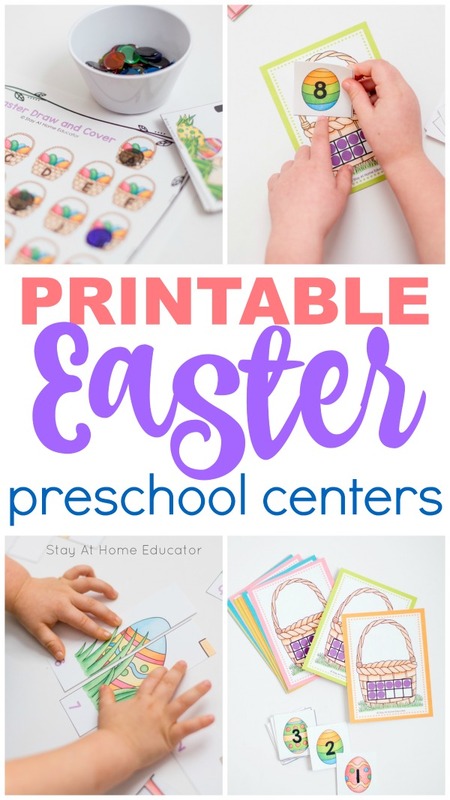 Think these printable Easter activities for preschoolers are just the thing you need to add to your preschool centers? (They are.) Seriously, they are so fun! You can grab them by clicking the link or the image below. 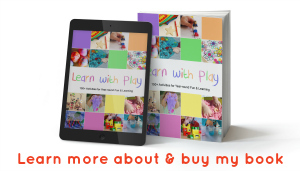 Then keep reading for even more Easter and spring activities for preschoolers! 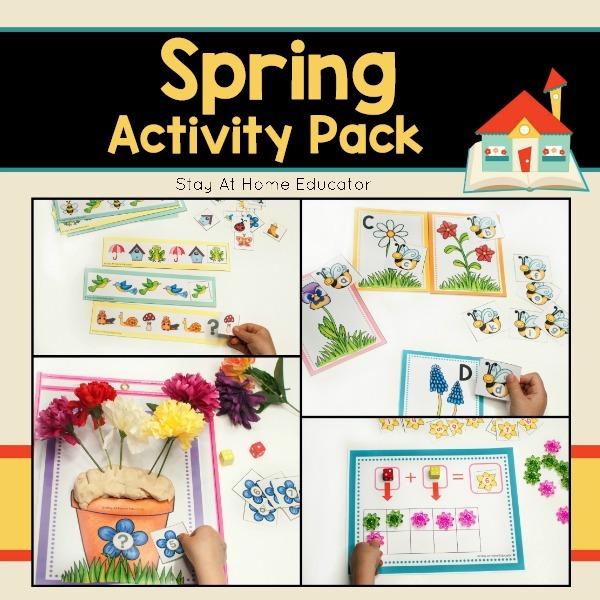 You’ll love this Spring Activity Pack, too! Get More Printable Easter and Spring Activities Here! Printables are such an easy way to prepare for teaching activities. Grab some of these free printable Easter activities for preschoolers. I’ve thrown in some spring activities too, because…spring!